The Ladies' Guide to Surviving Anypocalypse: Discretion is Advised. If you have any sense of self-preservation, you will not. Put yourself in that same neighborhood, but this time you are not Little Orphan Annie all grown up and brain damaged. This time you are making your way from one safe house to another. 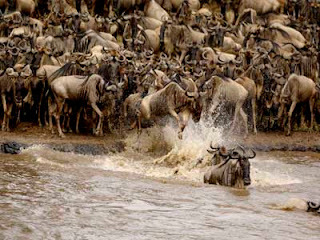 The Royal Order of Wildebeest have sentinels tracking survivors. Their orders are to trample on sight. Unfortunately, the R.O.W. are not your only threat. Survivors, the ones who don’t play well with others, are hiding in the buildings, burnt out cars, and anywhere else they can fit. They are watching as you go by. They want to know what you have and whether it's worth risking their lives to take from you. From a pre-invasion stand-point, nothing you carry has much value: water, rope, beef jerky, dried fruit, a small knife, and a flint. Not a gilded anything in the whole lot! From a post-apocalypse stand-point, you are ridiculously wealthy. You have a sudden urge to belt out a show tune. Perhaps one of the more upbeat songs from Les Misérables. You have made it this far, why in the name of Jeezus would you draw attention to yourself! You wouldn’t. You keep to the shadows as best you can. You keep your gear stored and out of sight unless you absolutely have to use it. If you are with a group of people, you talk as little as possible. And you sure as hell do not start arguing over who slighted whom. That’s an awesome way to get trampled.